By Tomo, Shingo and Masa. On May 9th 2015 our taxi was stuck in a traffic jam on the way home from MBAT Tournament at HEC Paris to Cambridge. This short question was enough to evoke our passion. 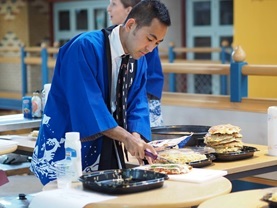 This was the beginning of what would become the first Japan Day at Cambridge Judge Business School. In this blog I’d like to introduce our motivations, what we did and our ultimate vision. One is a strong passion for making Japan an attractive place and the other is an entrepreneurial mindset. Shingo, originally from Hida Furukawa, which is famous for its preserved old town and beautiful country landscape in Japan, started his own company to attract tourists to Japan. While Tomo, originally from Okinawa, one of the southernmost islands of Japan, famous for its beautiful sea and unique cultures, is also keen to start his own business to attract more people to Okinawa. 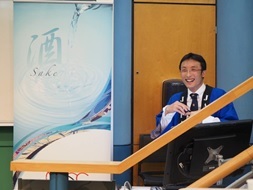 And me – I worked at Ministry of Economy, Trade and Industry in Japan before coming to Cambridge Business School. I’ve got a strong passion for reforming the Japanese social and economic system into a more sustainable one. I left the government precisely to pursue my own way of achieving this vision. So these strong passions and that entrepreneurial mindset came together to organise Japan Day. 2. So how did we do it? 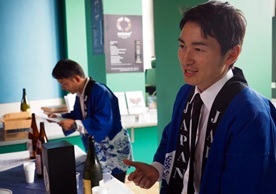 We’re the first Japanese students to organise a Japan Day at Cambridge Business School, so we faced a fair few challenges such as finding a place where we could serve Sake and Sushi, do performance and lectures. But finally, thanks to a lot of support, we organised a day of three parts, based at the business school. Here at Cambridge, our vision is to “leverage the power of academia for real world impact”, so we really wanted to have lectures that explained the background behind characteristics of Japanese culture and organisation. We asked Dr. Simon Learmount, Director of the MBA, to introduce a lecture about Japanese organization and culture. As well as inviting Ms. Rie Yoshitake, UK representative of Sake Samurai to give a lecture about the relationship between sake and Japanese culture. …Then came the sake and variety of Japanese foods such as sushi and okonomiyaki. Thanks to sponsorship by Rie Yoshitake and Tazaki Foods UK, we were able to offer a variety of sake. The first performance was Japanese drumming, which we call Taiko, performed by Ms. Kumiko Suzuki, professional Taiko performer in London. She gave participants the opportunity to play Taiko – which generated a great response. Then the second performance was a dance by the Japanese organisers- yours truly. Have you ever heard of World Order? It’s a very hip Japanese dance unit. The dance of this unit gets it’s comedy from trying to be uniform and systematic, which are important Japanese characteristics. Finally the third performance was Shamisenn, a kind of Japanese traditional guitar, performed by Mr. Hibiki, who is the only professional player of Tsugaru Shamisenn in the U.K. He played a variety of music from Japanese music to western music by traditional instrument. The combination of modern music and traditional instrument was really compelling. We then finished the event by doing Ipponjime, the popular way to finish parties in Japan. Due to time constraints, Japanese students were the primarily organisers of Japan Day in this instance. But this does not need to be the case! We encourage you to involve everyone in your planning. This way more people with an interest in Japanese culture can be a part of it. We’d be delighted if more and more people become fans of Japanese culture and visited Japan to feel and experience it firsthand. Ultimately we hope that more diverse people will use positive ethos of Japanese culture to make the world better place.